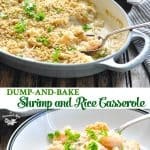 With just 10 minutes of prep, this Dump-and-Bake Shrimp and Rice Casserole is a delicious and easy dinner recipe for busy nights! 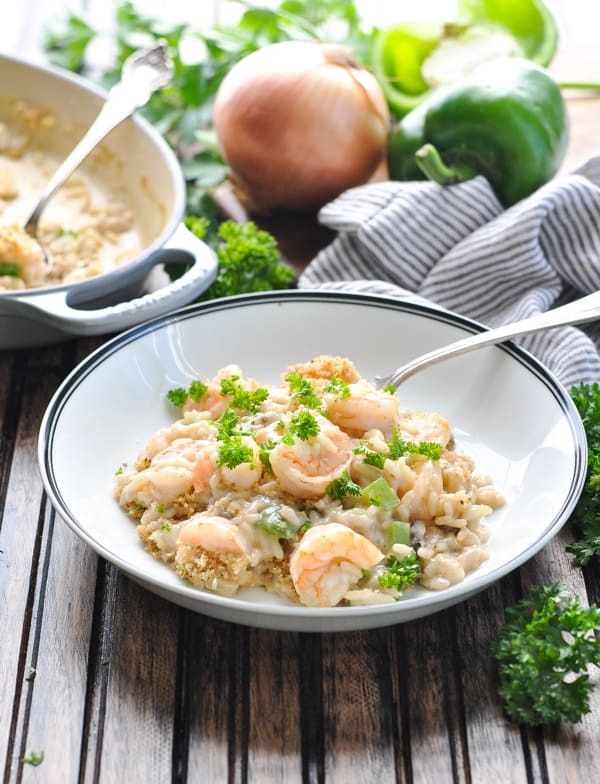 Wondering what to make with shrimp and rice from your pantry? 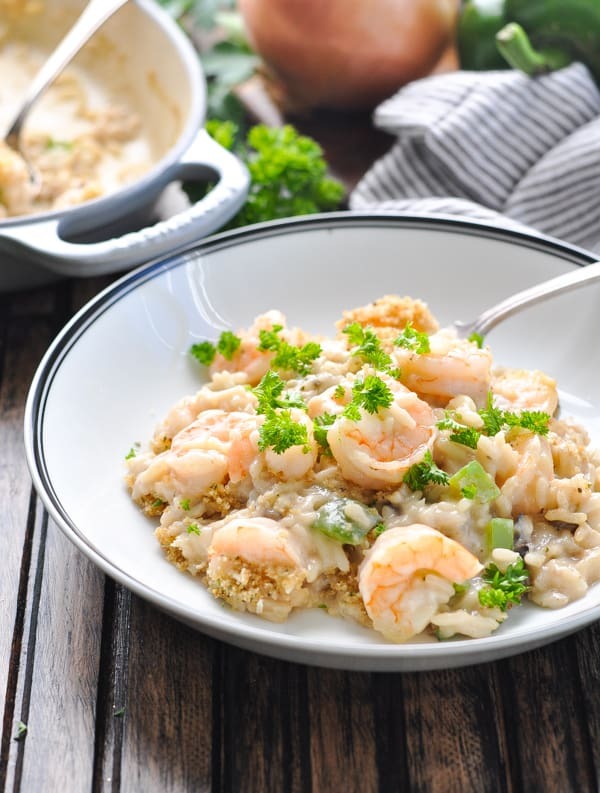 With just 10 minutes of prep, this Dump-and-Bake Shrimp and Rice Casserole is a delicious and easy dinner recipe for busy nights! 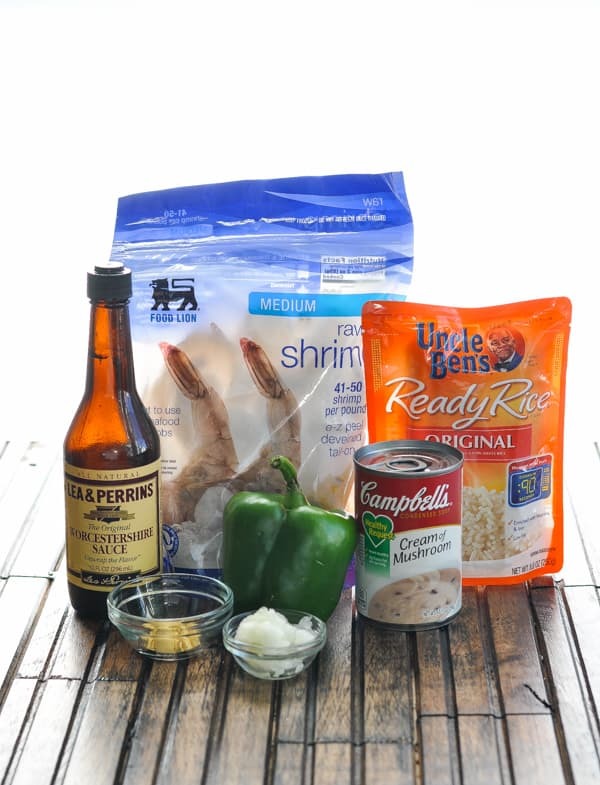 I have certain kitchen staples that I always keep on hand for quick last-minute meals, and frozen shrimp and white rice are two of those must-have items. 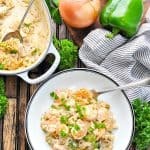 There are endless ways to combine these two ingredients for a simple supper, and this just might be one of the best yet: a light, creamy casserole that’s full of flavor and ready in just minutes! 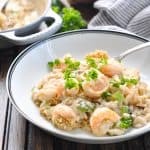 This baked shrimp and rice recipe takes advantage of just a handful of shortcut ingredients to get a meal on the table quickly! First combine condensed soup, bell pepper, onion, cooked rice, Worcestershire sauce, ground mustard, pepper and shrimp in a large bowl. If you’re using a package of instant microwaveable rice (such as the Uncle Ben’s Ready Rice shown here), you do NOT need to microwave it in advance. Just dump-and-stir! 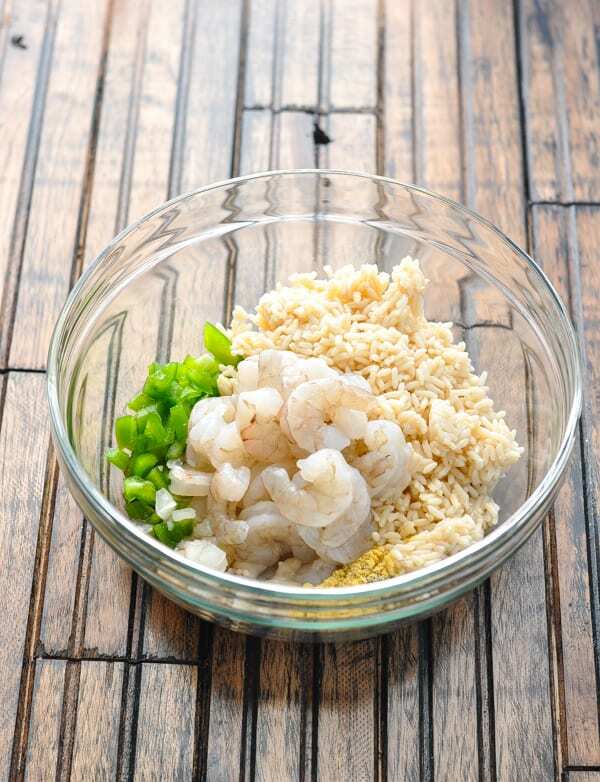 Transfer the shrimp mixture to the prepared baking dish and set aside. Now let’s make the topping. Because every good casserole deserves a buttered bread crumb topping, right? I used Italian style bread crumbs (because the extra seasoning adds nice flavor), but you can use any bread crumb that you prefer. Combine the bread crumbs will melted butter and Parmesan cheese, then sprinkle over top of the casserole. The shrimp and rice bake in the oven, covered, at 350 degrees for 20 minutes. Remove the cover, bake for an additional 10 minutes, and your shrimp should be pink, and your topping should be golden brown. 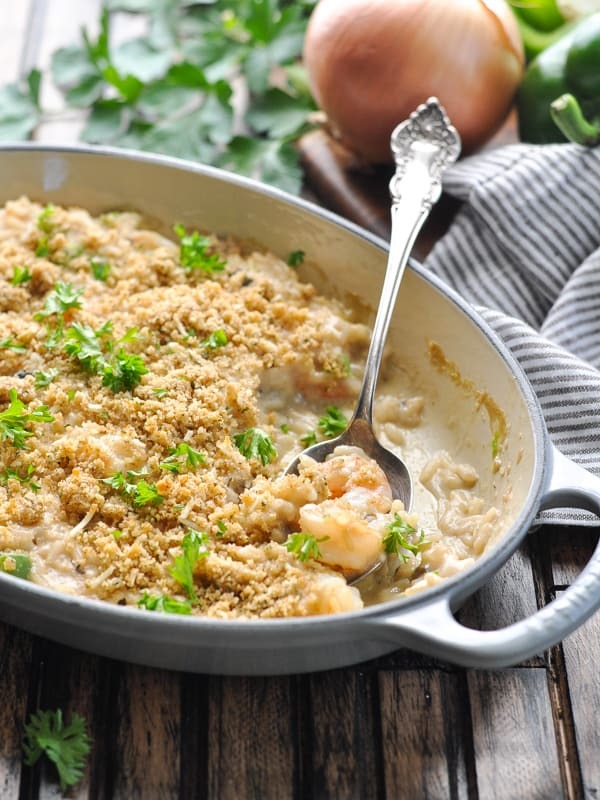 Keep an eye on the dish during the final few minutes of baking, because you don’t want to overcook the shrimp (it will turn out tough and chewy…no, thank you)! You know it’s ready to come out of the oven as soon as the shrimp turns pink. 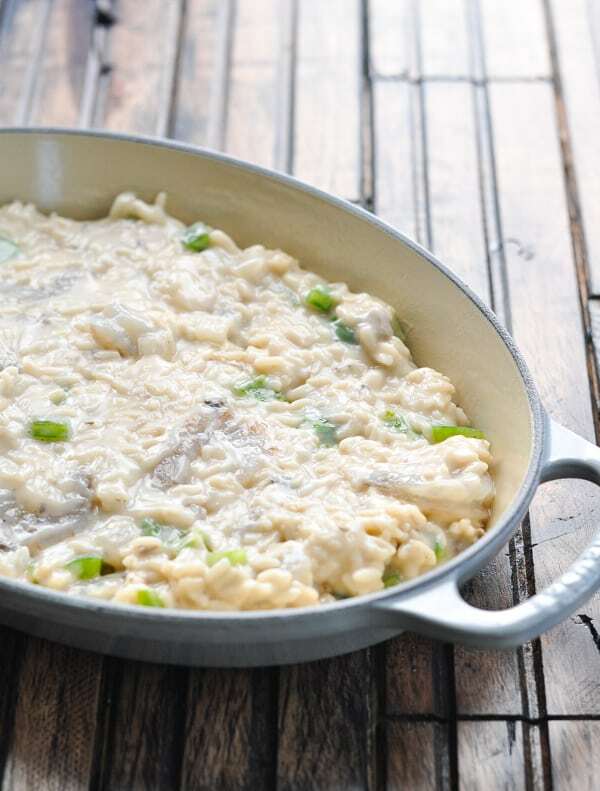 Use any variety of cooked rice that you prefer — wild rice, brown rice, or white rice all work well! If using a package of microwaveable rice (such as Uncle Ben’s Ready Rice shown here), you do NOT need to microwave the rice before adding it to the casserole. It will bake in the oven and be perfectly tender by the end! Fresh or frozen (and thawed) shrimp are both fine to use here. The cooking time is based on medium size shrimp (41-50 count per pound), so if you use larger or smaller shrimp, you will need to adjust the cooking time accordingly. The recipe calls for cream of mushroom soup, but you can substitute with any flavor condensed soup that you prefer. Cream of celery would be another good option! This small recipe serves about 2-3 people. 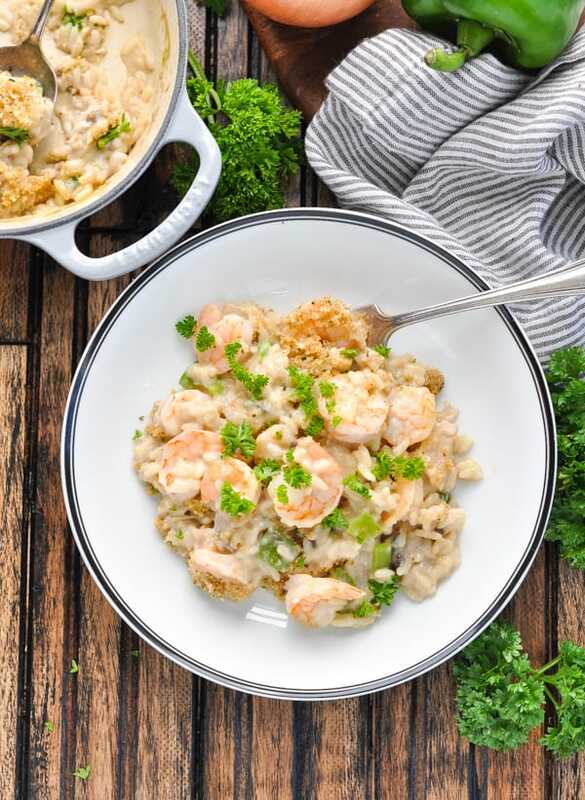 If you are feeding a larger family, I recommend doubling the ingredients and baking the shrimp and rice casserole in a 9 x 13-inch dish. What goes with Shrimp and Rice Casserole? Preheat oven to 350 degrees F. Spray a 1 ½ quart baking dish with cooking spray and set aside. In a large bowl, stir together condensed soup, bell pepper, onion, rice, Worcestershire sauce, mustard, pepper and shrimp. Transfer to the prepared baking dish. 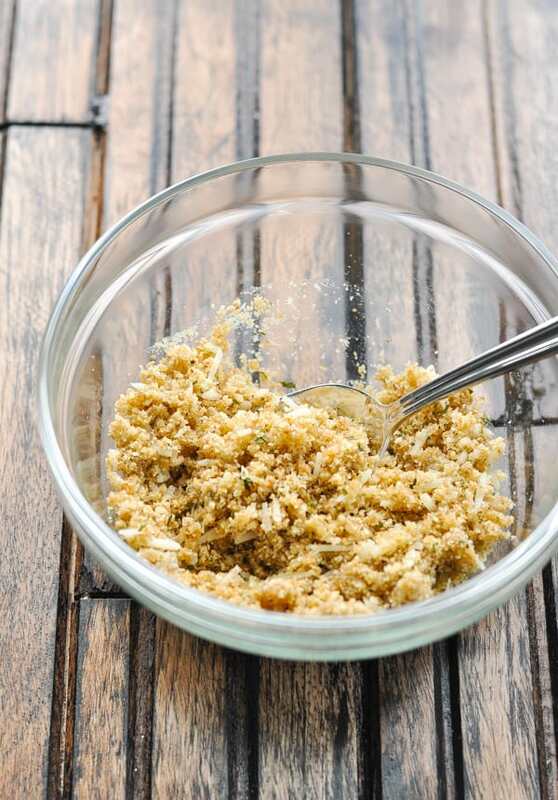 In a small bowl, combine breadcrumbs, melted butter, and Parmesan cheese. Sprinkle breadcrumb mixture over top of the casserole. Cover and bake for about 20 minutes. Remove the cover and continue baking (uncovered) for about 10 more minutes, or until shrimp are pink and breadcrumbs are golden brown. Use any variety of cooked rice that you prefer -- wild rice, brown rice, or white rice all work well! If using a package of microwaveable rice (such as Uncle Ben's Ready Rice shown here), you do NOT need to microwave the rice before adding it to the casserole. It will bake in the oven and be perfectly tender by the end! 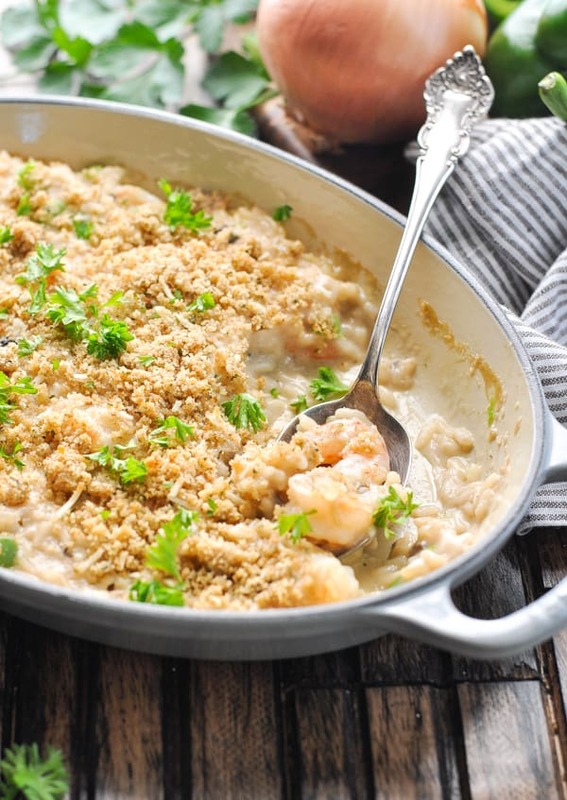 Keep an eye on the dish during the final few minutes of baking, because you don't want to overcook the shrimp (it will turn out tough and chewy...no, thank you)! You know it's ready to come out of the oven as soon as the shrimp turns pink. Hi Blair! This recipe looks wonderful and I can’t wait to try it. I was wondering if it would be a good idea to sautee the onion and the green bell pepper before adding them to the rest of ingredients? So, I made this recipe and it turned out sooo yummy and easy to prepare!! I finally didn’t pre-cook the veggies and they were tender as you mentioned above. Next time I think I will add a little garlic,but just because I’m such a garlic lover and I think it would work well with this dish. My husband and girls really enjoyed it! Thanks for sharing your recipes!! So glad to hear that! Thanks, Alicia! Enjoyed the recipe very much as did my family. Only change I’ll make the next time, is adding some garlic. Thanls it was delish!